The government is visibly ramping up its enforcement efforts related to financial crimes. In recent days, for example, SEC Commissioner Luis Aguilar stated that the agency is now investigating the "disturbing trend" of Chinese and other companies registered through backdoor mergers with dormant shell companies. "While the vast majority of these companies may be legitimate businesses, a growing number of them have accounting deficiencies or are outright vessels of fraud," Commissioner Aguilar said. The SEC has also ramped up its enforcement efforts in the area of financial fraud at asset management firms, and has established a specialized unit within its Enforcement Division devoted to that function. This unit will spell “trouble with a capital T’’ for fund managers, according to legal experts. More broadly, the SEC is also now working more closely than ever with the DOJ, and with task forces in key U.S. Attorney’s Offices such as New York, Virginia and New Jersey, to help identify and aggressively prosecute financial fraud. 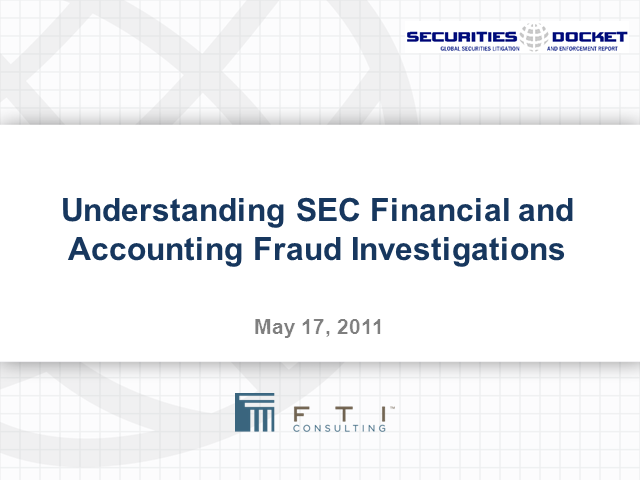 Participants of this webinar will learn about recent SEC actions and the legal framework of accounting and financial fraud. In addition, we will address the common types of accounting fraud and the damages that arise as a result, illustrated by a case study.